Hi Everyone!! 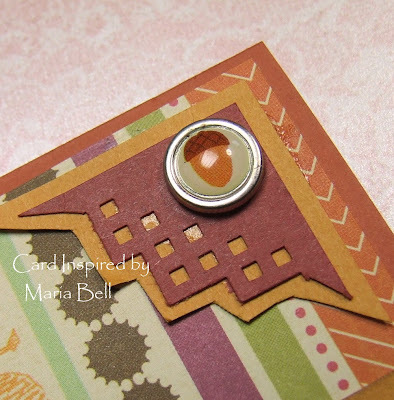 I actually made a few cards but I've been experiencing blogging burn out lately. Did you know I've been blogging, creating tutorials, creating sketches, making cards practically daily for the past two years. 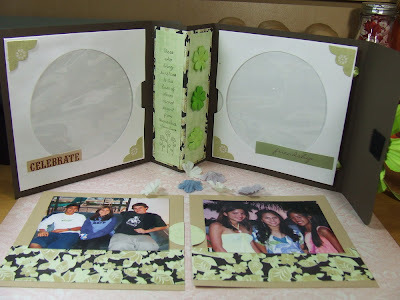 I started blogging in December of 2006. . .my blog anniversary is actually coming up soon! Wow, I can't believe it's been almost 2 years. It's been a fun ride and I've enjoyed every minute of it. I've met such cool people that I would have not otherwise met if it wasn't for blogging. It's not the blogging that is the problem but for the past few months, I've been wanting to spend more time with my daughter. She's heading out to college next year and I almost feel like there's so little time left to be with her as a "child". I feel a little sad about it but I don't think it has really hit me yet. Actually, I went through an "anticipatory grieving" process when she first entered high school about 3 1/2 years ago. What does this mean? Basically, it's anticipating a loss when it hasn't occured yet. You behave like you're experiencing a real loss . . .you know, you get depressed, cry, feel sad, grieve like the experience is actually happening. It's a coping mechanism. . .it's a way for you to prepare for an expected loss so it won't be so bad when it actually happens. Basically, you've cried yourself dry so when it occurs, you already know how it feels so the impact is less severe. Anyway. . .not only do I want to spend more time with my daughter but I've been doing other things that's kept me from managing my time effectively. Can you imagine. . .blogging needs to be time managed! LOL! I'm not saying I'm not going to blog any more. . .it's just that if I don't blog for several days, it's usually because I'm spending quality time with my family. I don't know if it matters but I just wanted to let you know what's up with me! Until next time! Hope y'all have a wonderful week! Happy Sunday, Everyone! 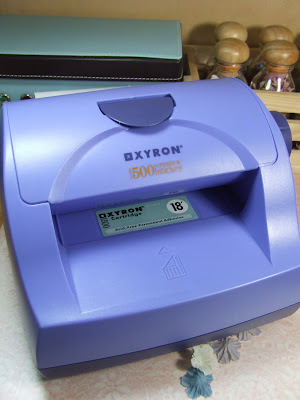 A few weeks ago I had bought a "value" set of scrapbooking stuff and the set contained mini 3.5 x 3.5 card bases that had no envelope to go along with them. 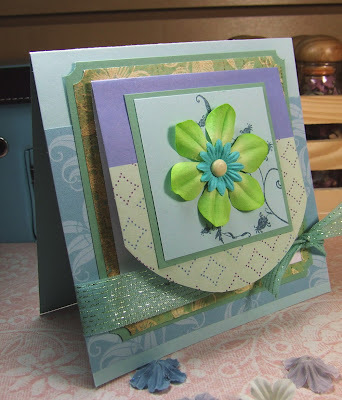 I don't have envelopes that could accommodate the cards and I wasn't in the mood to create my own envelopes so I decided to attach the mini cards to a 5.5 x 5.5" card base and treat it as a design element. 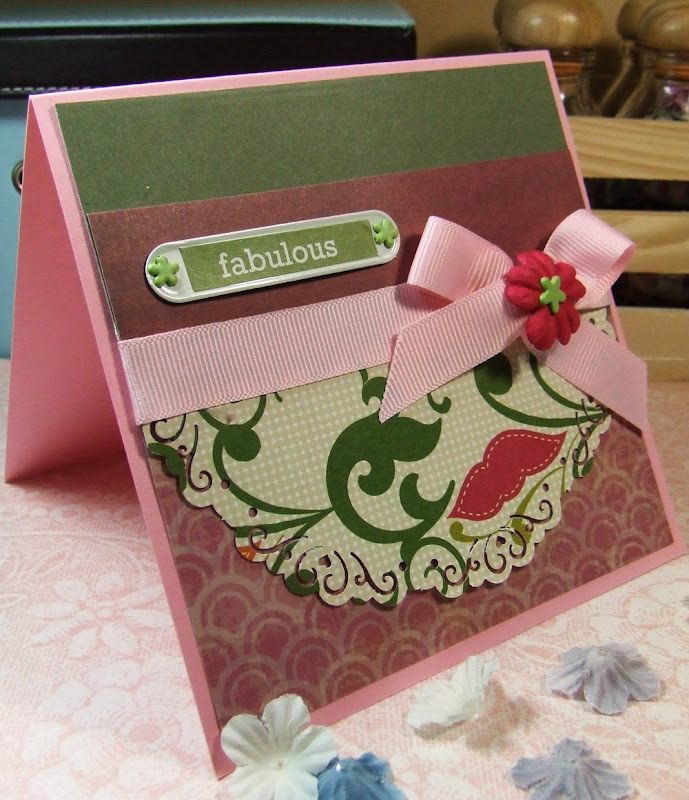 It gave me a great opportunity to use some of my scrap designer paper as well so I made a bunch of these cards. It was so quick and easy to create the cards that it was actually quite fun. I actually made 4 of them really quickly and I'll be posting them in the next few days. 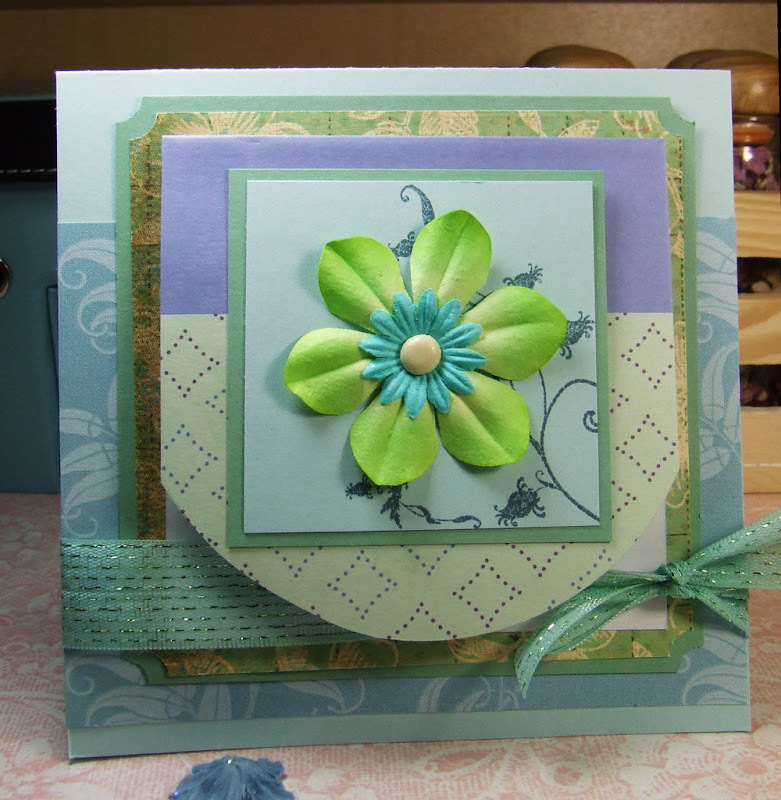 All I did was attach a small panel on to the mini card and added the Prima flower. 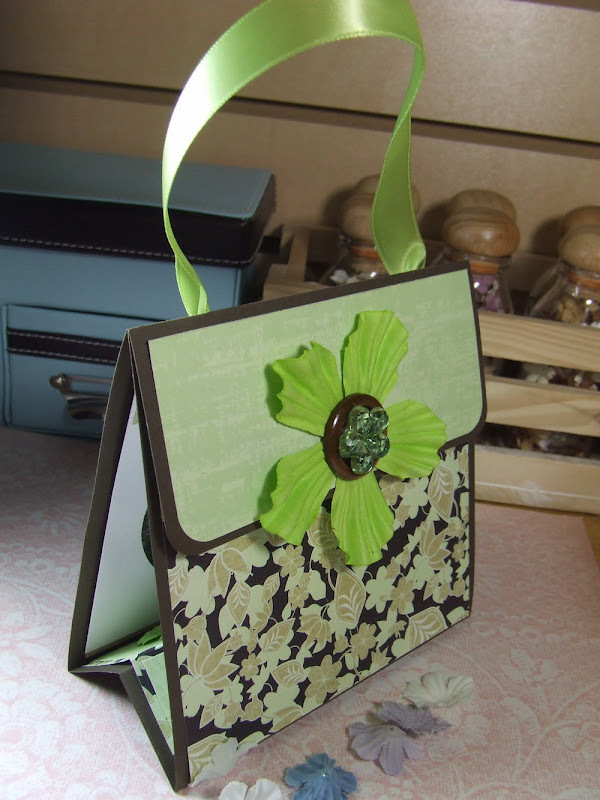 I decorated the card base with designer paper and attached the mini card on to the card base. 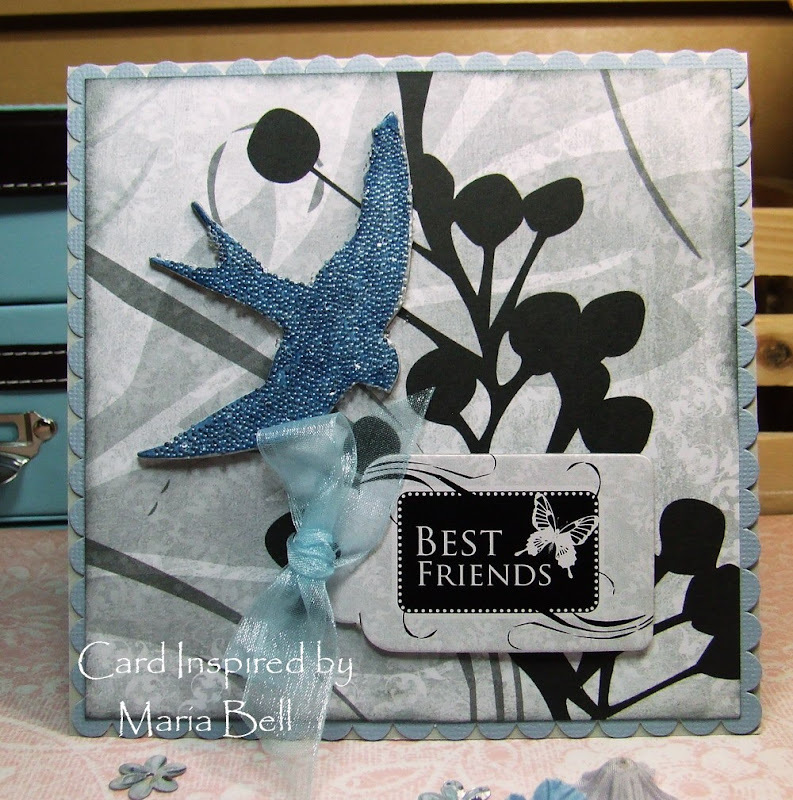 Rather than adding a sentiment to the outer aspect of the card, I decided to stamp the inner panel of the mini card. 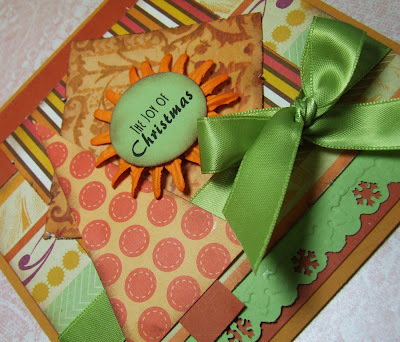 To finish up the card, I added a ribbon. I think this card took me about 15 to 20 minutes to create. It was super fast. Love it! Anyway. . .not much else to the card. I'll post the other similar cards I made later. Hope y'all have a fabulous day!! Hi Everyone! 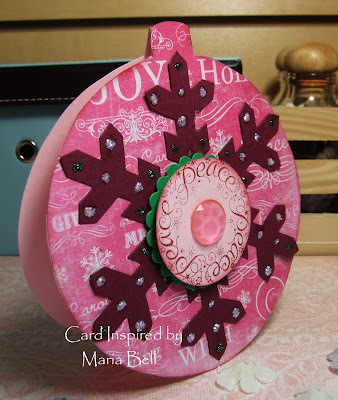 Just another ornament card that I made. I was suppose to add a cap but in my rush to finish the card, I forgot to add it. 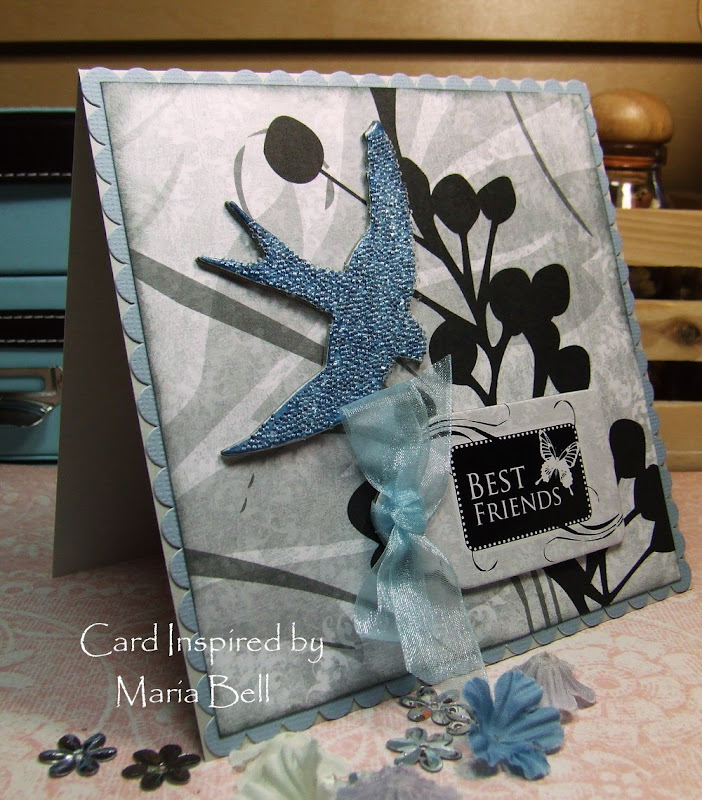 It was fun creating this card. 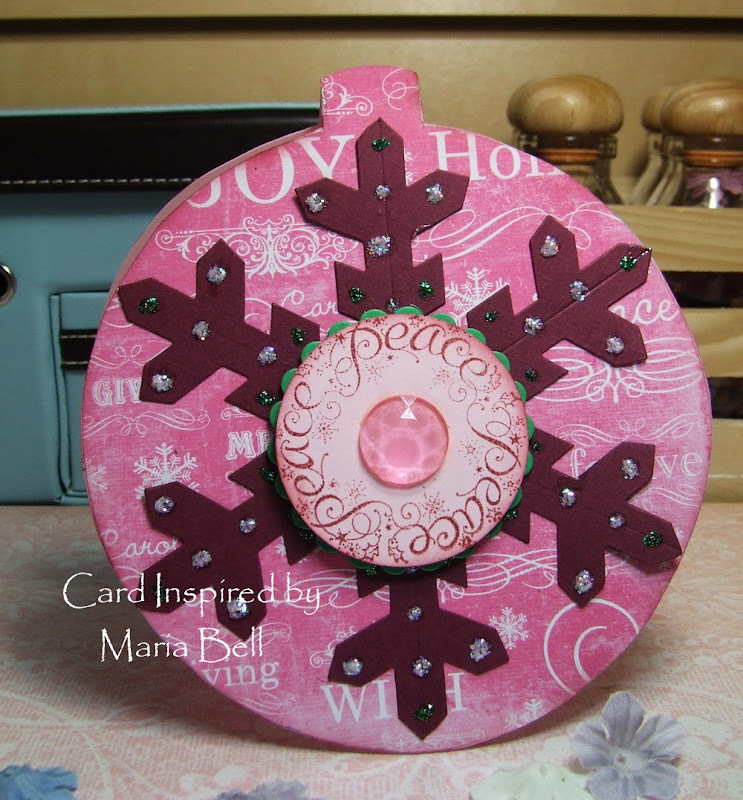 I used the large Sizzix die to create the large snowflake. I added a bit of Stickles to the snowflake so it can stand out more. 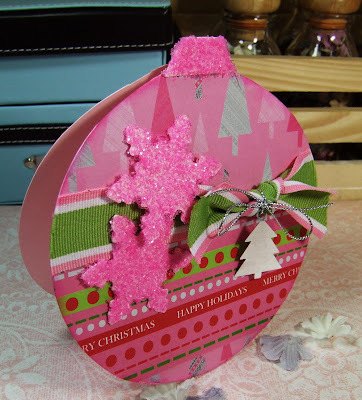 Initially, I was just going to create a 5.5 x 5.5" card and add the snowflake but decided to put it on the ornament shape. 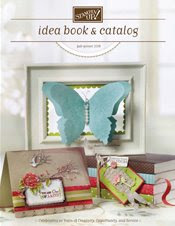 I recently bought a Christmas stack of designer paper but I still have stacks from 2 years ago! Argggh! I really need to start doing somethng with these designer papers. The funny thing is some of the patterns are coming back in popularity so I guess it's a good thing to keep your old designer papers. Anyway, I'm off to pick up my daughter from school so this post will be a short one. Hi Everyone! 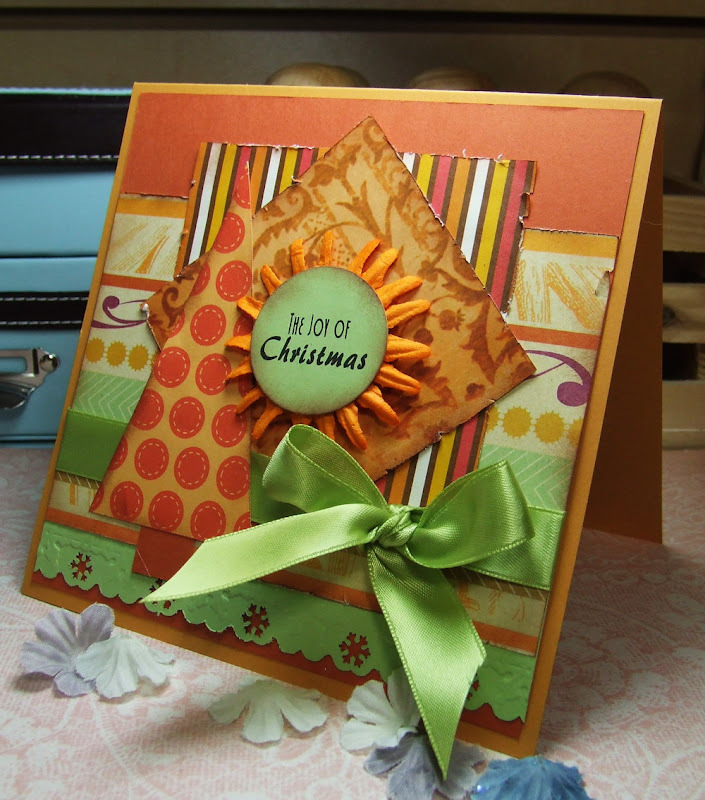 This card was inspired by a card I saw in the Paper Crafts December issue. Do you still buy magazines? I still do but I rarely see a card in the magazines that inspire me. I buy the magazines because I sometimes look at them before I go to bed or if I'm somewhere that requires me to wait, like the doctor's office, etc. I like to look through the magazines to kill time. I do have a laptop that I could probably bring to bed but it's too cumbersome to do that. 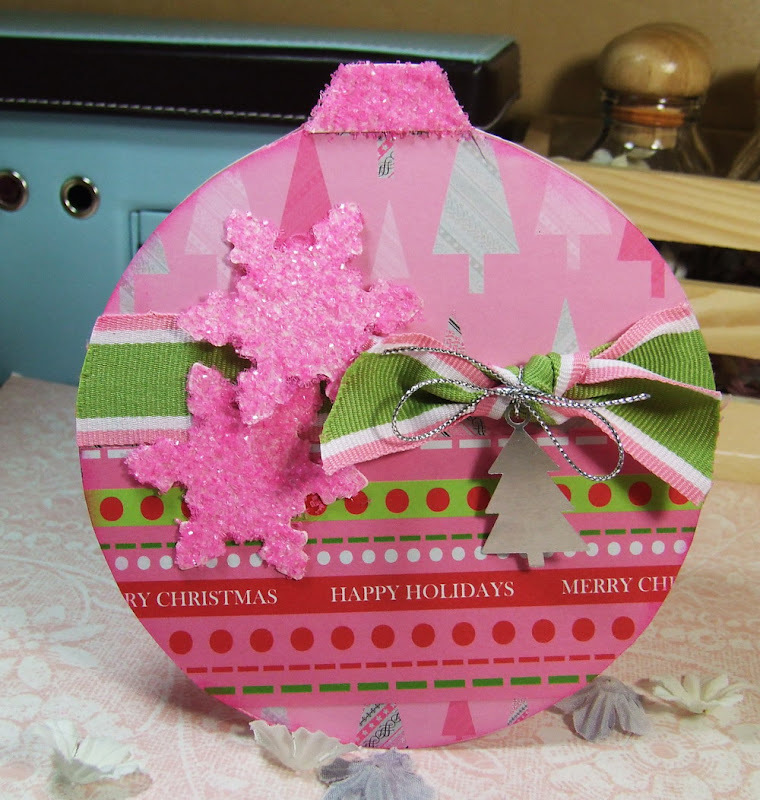 I created that circle border using Fiskar's Circle border punch. I'm not sure the name of the exact design. 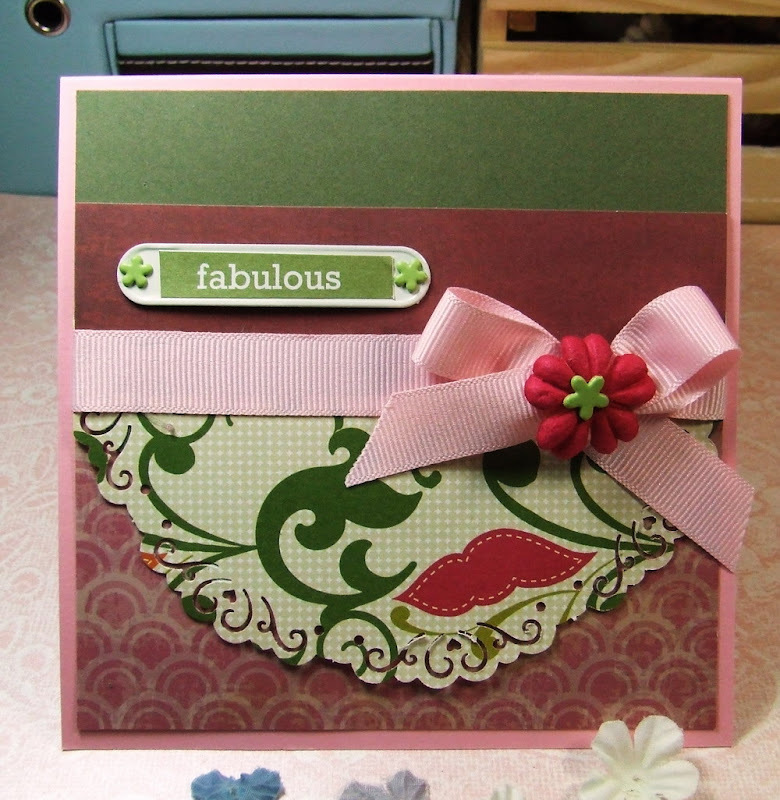 Fiskar now sells an oval border punch. I almost bought it today but decided that I need to use my circle ones first before buying a new punch. 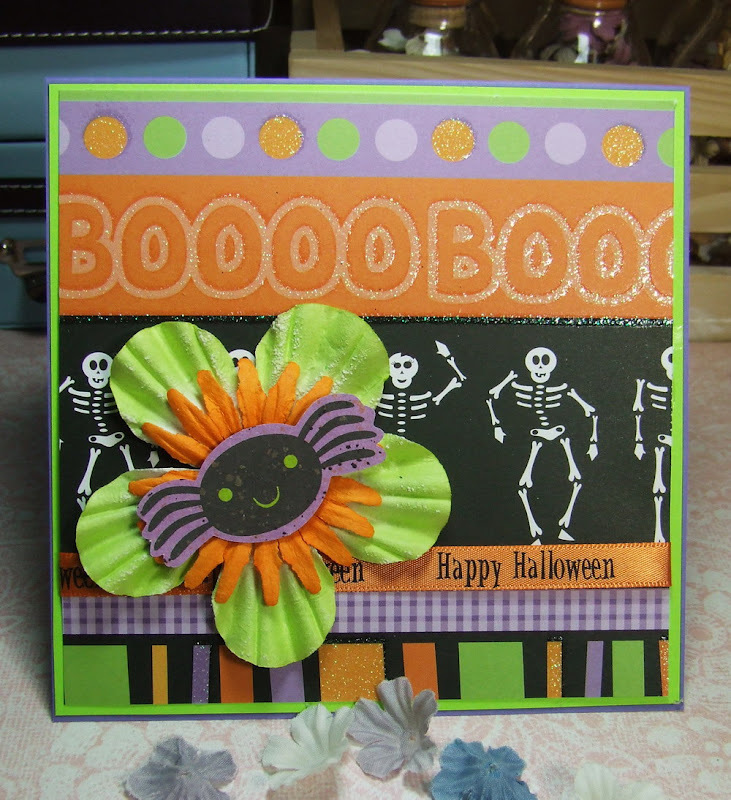 Can you believe it but it took me 2o minutes to look for a sentiment that matched my card's color. Argggh! I should have just created a sentiment on my computer but I have a lot of sticker sentiments, it's a matter of looking for the right one. 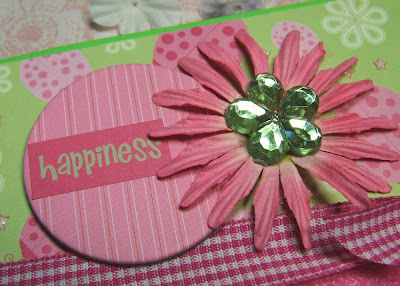 I adhered the sticker on to a metal label embellishment made by Colorbok and attached it to my card using Making Memories daisy brads. Nothing much else to discuss about this card. Hope you all have a fabulous week!! Hi Everyone!! Want to find a way to save money? Dye your clear glitter with ink refills. By dying your clear glitters, you can have many different colors of glitter without having to buy a whole bunch of different colored glitters which can get pretty expensive. Click on the tutorial on how create different colored glitters. 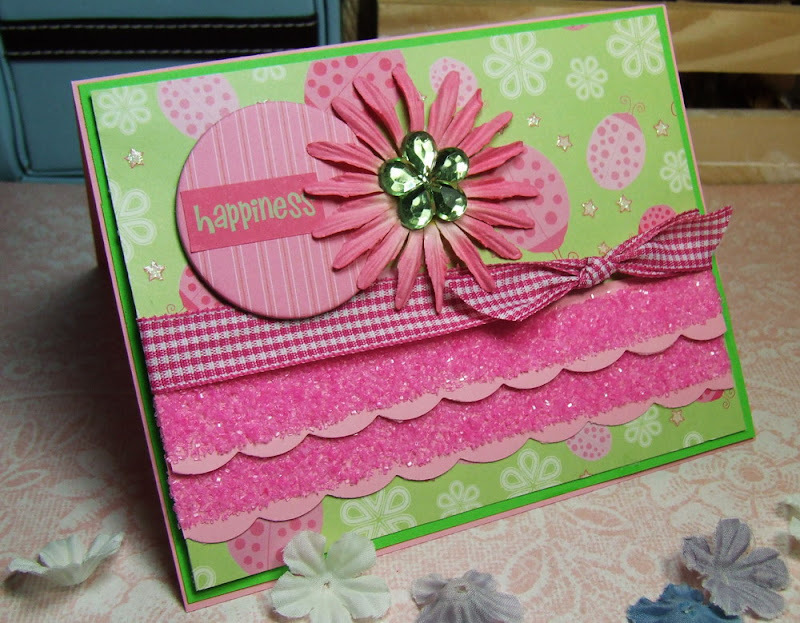 I don't know what is up with me but lately I've been creating a lot of "green and pink" cards. I seem to gravitate towards this color combo and it's not like it's even my favorite. 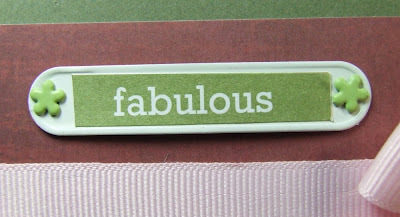 I think it's because I have a lot of designer papers with green and pink colors. 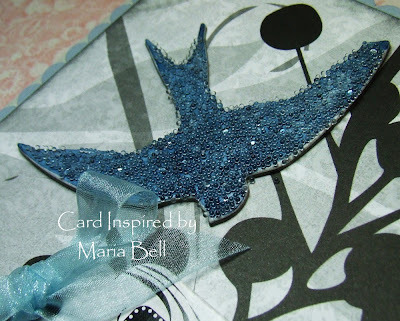 Anyway. . .just a quick post. . .nothing much to this card except for the dyed glitter on my card. 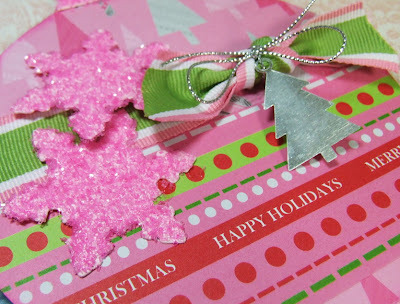 Here's a close up of the pink glitter that I colored myself with the ink refill. Check out the tutorial and try it out!! Hi Everyone!! 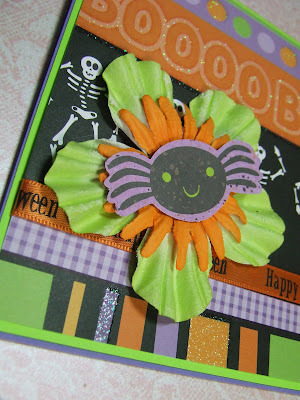 Just another Halloween card. . .again, just trying to "waste" the designer paper. 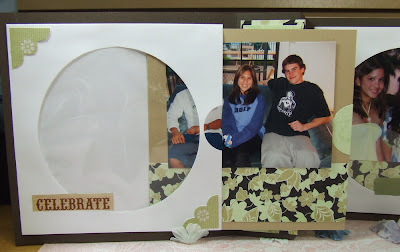 I actually used up the whole 12 x 12" designer paper. Well, I have one more small piece but I'm so happy that I used the majority of it. Do you have that problem? You know, finding different ways to use up a large 12 x 12" designer paper. I don't like to make duplicate cards so I end up with lots of pieces of scrap paper. Anyway, nothing much to this card. 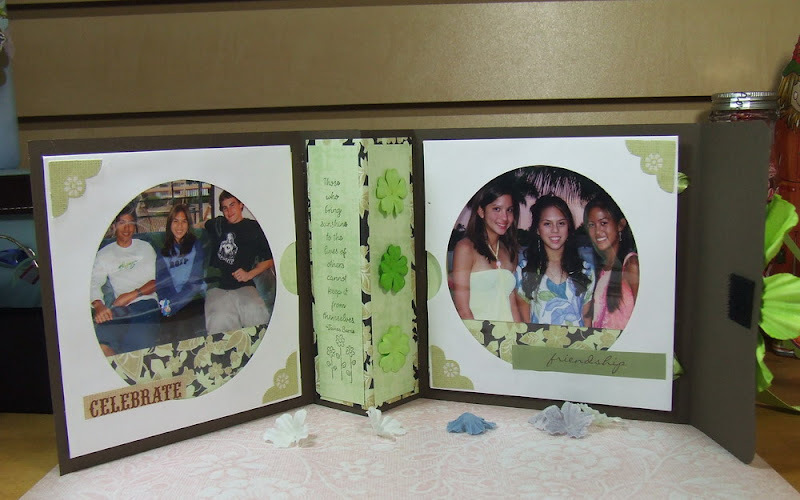 All I did was add the primas and attached a die cut to the prima and added the ribbon. That's it. Okay. . .on to my next card. Hope y'all have a fabulous day. 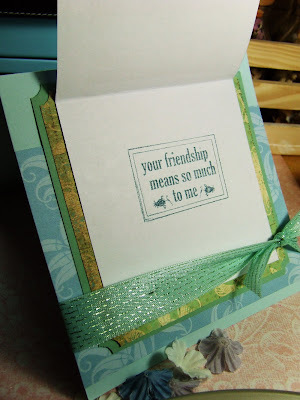 Oh, before I go. . .stop by my Stampin Inspirations Club site and Stampin Inspirations . . .I posted more cards on those sites today. I was on the ball yesterday. Hi Everyone! 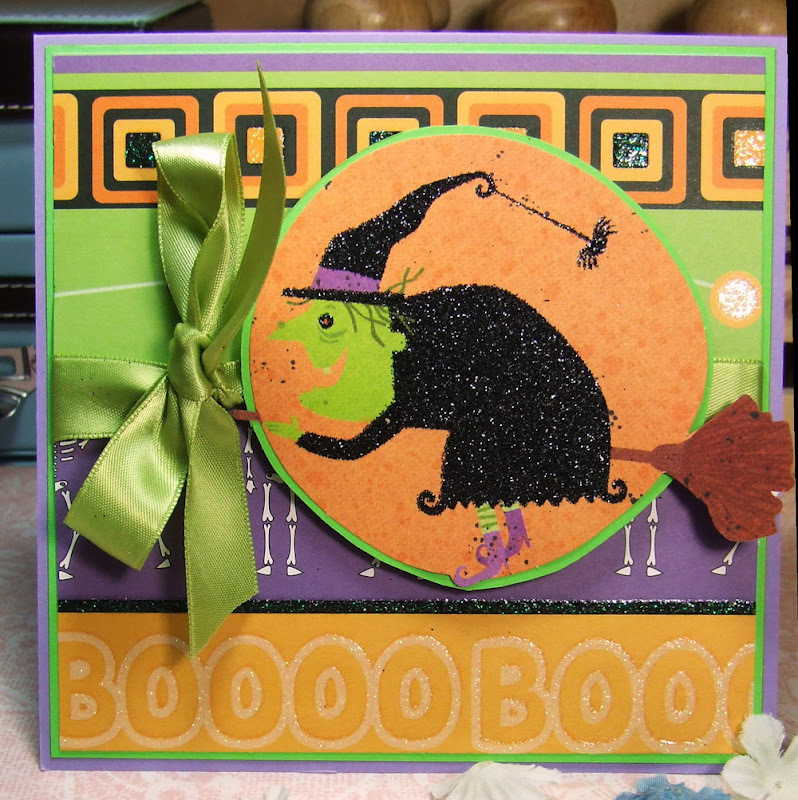 I worked on this Halloween card last night. It was one if those 10 minute cards. . .seriously!! 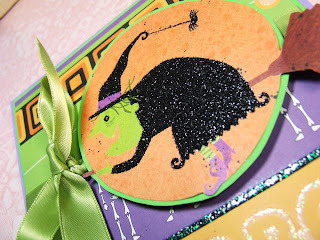 The designer paper and witch was already designed with glitters and all I did was add the ribbon! That's it! Gotta love these 10 minute cards that looks like you put a lot of work into it! Tricky, Maria! LOL! 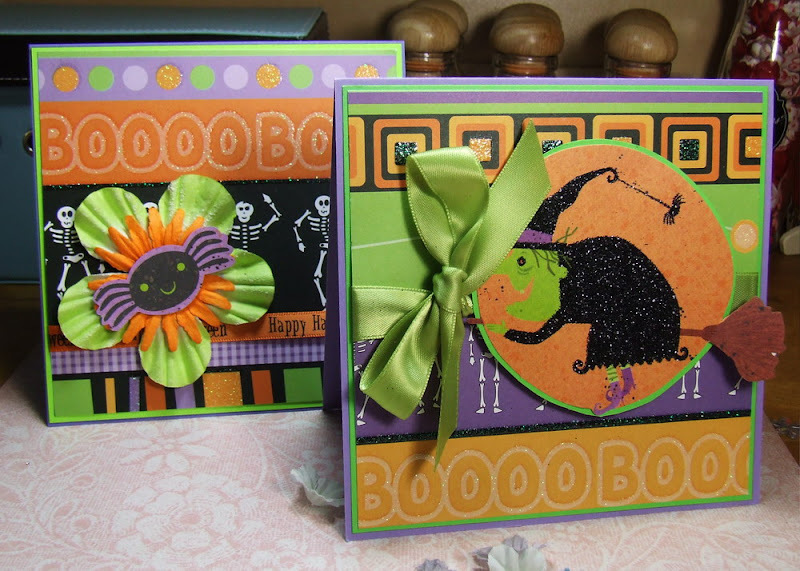 Anyway, my goal today is to work on Halloween cards. . .I need to crack the whip on making them because Halloween is slowly creeping closer. I have to work on making goody bags . . .at least a 100 of them for my daughter's "Key Club". I think I better start now, huh! Well, I hope y'all have a fabulous day!! Hi Everyone!! I'm sorry I've been MIA for the past week! 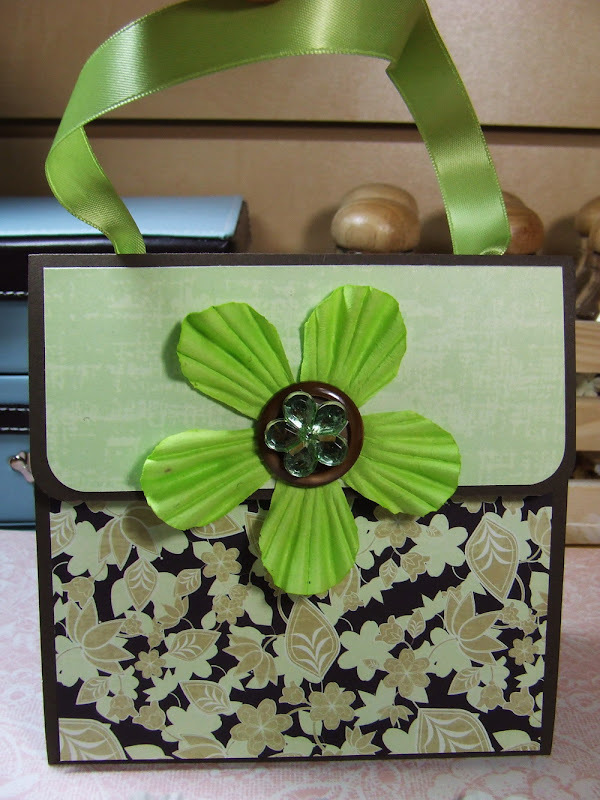 I've been busy preparing kits for my Stampin Club and getting them mailed out so I had to take a creative break. Well, I'm back!! 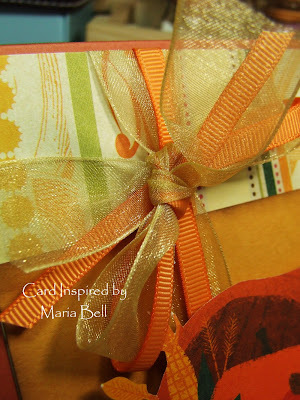 I'm still working on Thanksgiving and holiday cards. 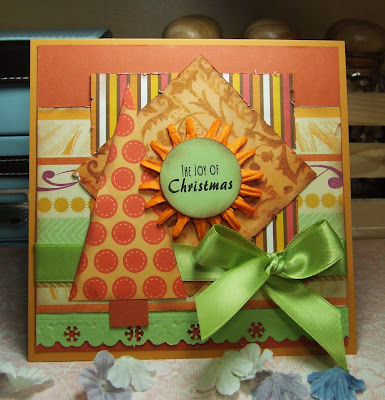 I bought a package of K&Co Fall die cuts and I'm just trying to use them up or at least reduce them. 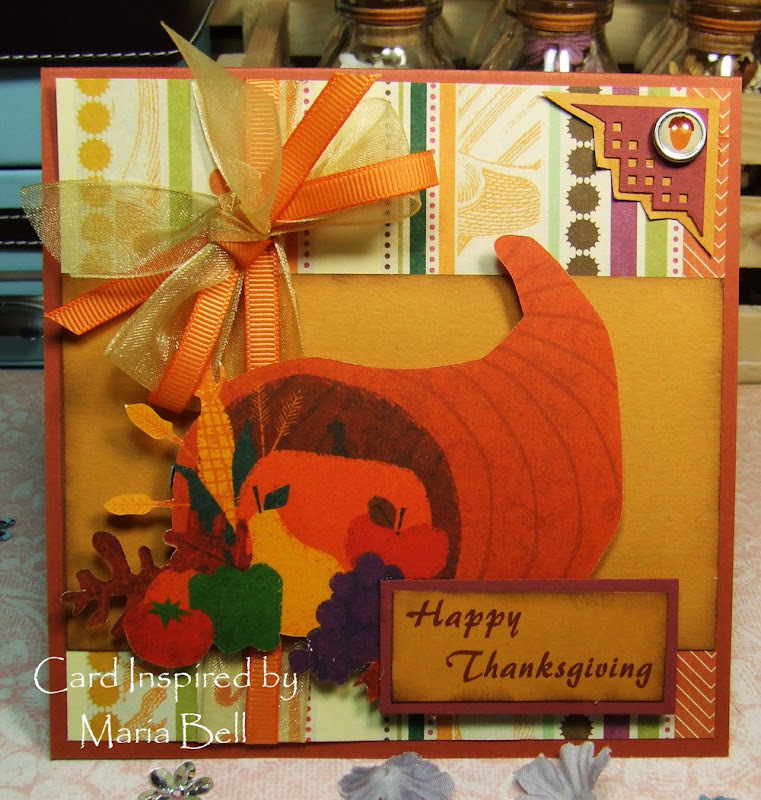 To help in the process, I made a card using the cornucopia die cut. Nothing much else to the card. I'm thinking starting the beginning of the new year that I'm going to reduce my blogging time. I spend more time blogging than I do creating! LOL! There's so many things I want to do and create but time seem to be so limited. I try to squeeze as much of my "free" time to craft but for some reason, this time seem to be getting shorter and shorter. I also want to concentrate on losing weight. Sitting down blogging and crafting well, is very sedentary and I think contributes to my inability to lose weight. I want to lose at least 20 pounds. Arggh!! I've been trying to lose this 20 pounds for years and can't seem to do it. 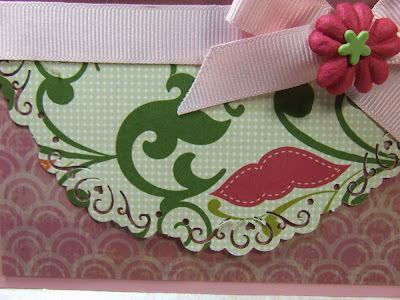 Anyway, back to my card. . .the picture to the right is a double ribbon bow. I just took two ribbons and created the bow together like one big bow. This brad is from the Target $1 bin. I think it's such a cute brad and perfect for this Thanksgiving card. It's amazing what you can find in the $1 bins. You just gotta dig through them. Anyway, I'll work on another holiday card. Maybe Halloween. . .